A novel partial frequency response channel estimator is proposed for OFDMA systems. 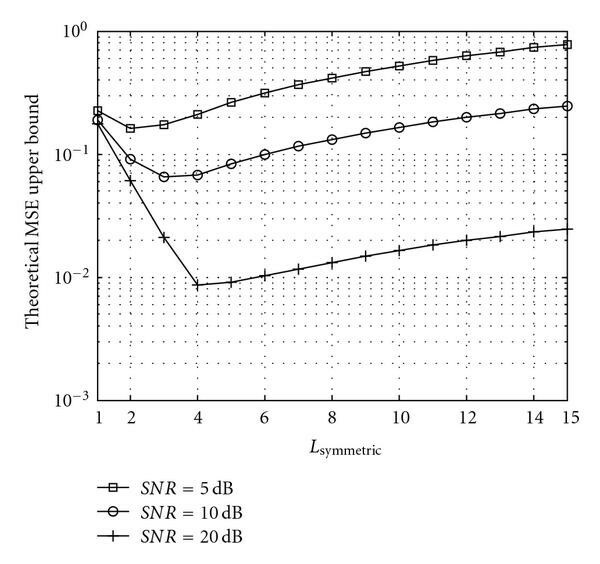 First, the partial frequency response is obtained by least square (LS) method. The conventional discrete Fourier transform (DFT) method will eliminate the noise in time domain. However, after inverse discrete Fourier transform (IDFT) of partial frequency response, the channel impulse response will leak to all taps. As the leakage power and noise are mixed up, the conventional method will not only eliminate the noise, but also lose the useful leaked channel impulse response and result in mean square error (MSE) floor. 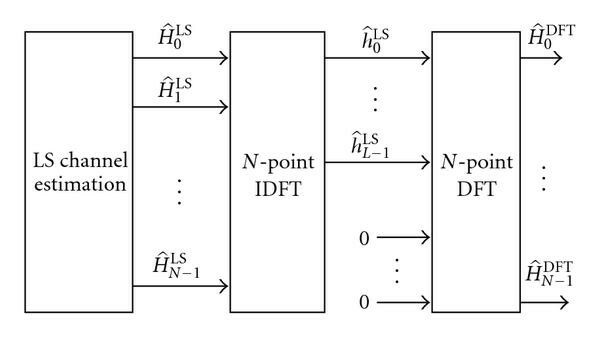 In order to reduce MSE of the conventional DFT estimator, we have proposed the novel symmetric extension method to reduce the leakage power. 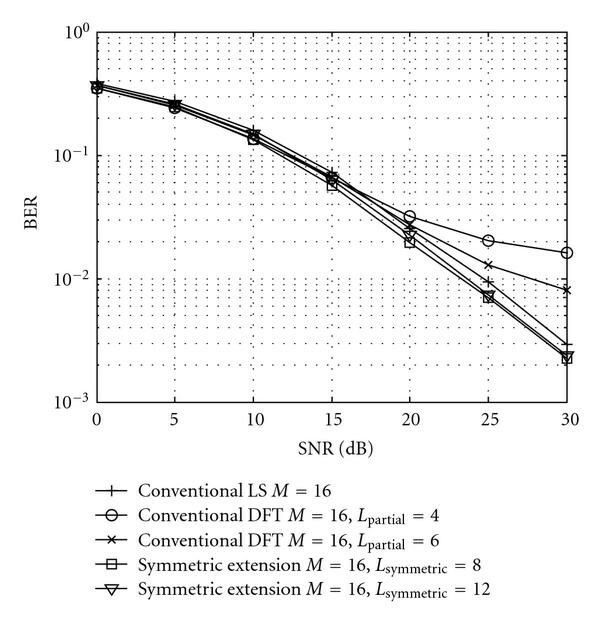 The estimates of partial frequency response are extended symmetrically. After IDFT of the symmetric extended signal, the leakage power of channel impulse response is self-cancelled efficiently. Then, the noise power can be eliminated with very small leakage power loss. The computational complexity is very small, and the simulation results show that the accuracy of our estimator has increased significantly compared with the conventional DFT-based channel estimator. The orthogonal frequency-division multiplexing (OFDM) is an effective technique for combating multipath fading and for high-bit-rate transmission over mobile wireless channels. In OFDM system, the entire channel is divided into many narrow subchannels, which are transmitted in parallel, thereby increasing the symbol duration and reducing the ISI. Channel estimation has been successfully used to improve the performance of OFDM systems. It is crucial for diversity combination, coherent detection, and space-time coding. 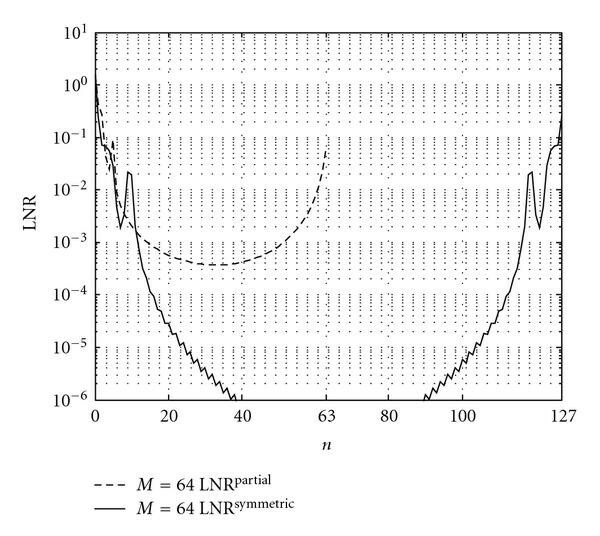 Various OFDM channel estimation schemes have been proposed in literature. The LS or the linear minimum mean square error (LMMSE) estimation was proposed in . Reference  also proposed a low-complexity LMMSE estimation method by partitioning off channel covariance matrix into some small matrices on the basis of coherent bandwidth. However, these modified LMMSE methods still have quite high-computational complexity for practical implementation and require exact channel covariance matrices. Reference  introduced additional DFT processing to obtain the frequency response of LS-estimated channel. In contrast to the frequency-domain estimation, the transform-domain estimation method uses the time-domain properties of channels. Since a channel impulse response is not longer than the guard interval in OFDM system, the LS and the LMMSE were modified in [4, 5] by limiting the number of channel taps in time domain. References [6, 7] showed the performance of various channel estimation methods and yielded that the DFT-based estimation can achieve significant performance benefits if the maximum channel delay is known. References [8–11] improved upon this idea by considering only the most significant channel taps. Reference  further investigated how to eliminate the noise on the insignificant taps by optimal threshold. 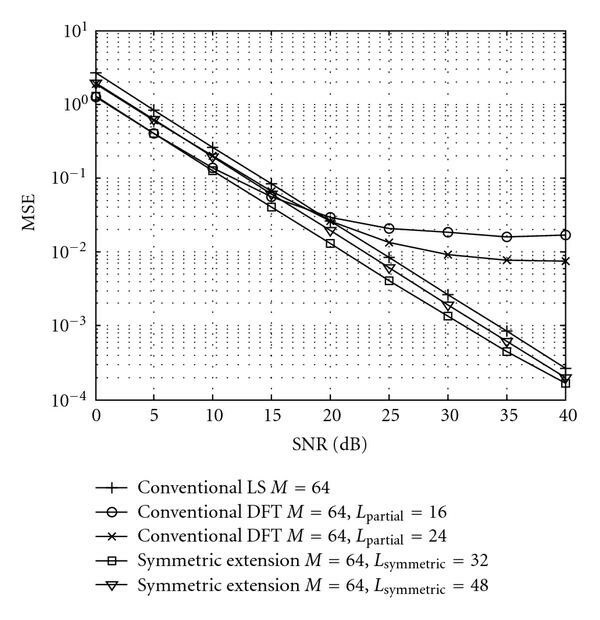 However, in many applications such as OFDMA system, only the estimates of partial frequency response are available, and the estimate of channel impulse response in time domain cannot be obtained from the conventional DFT method. After IDFT of partial frequency response, the channel impulse response will leak to all taps in time domain. As the noise and leakage power are mixed up, the conventional DFT method will not only eliminate the noise, but also lose the useful channel leakage power and result in MSE floor. We have proposed the novel symmetric extension method to reduce the leakage power. The mathematic expression of the MSE of the conventional DFT estimator and the upper bound of the MSE of our proposed estimator are derived in this paper. The rest of the paper is organized as follows. Section 2 describes the system model and briefly introduces the statistics of mobile wireless channel. Section 3 proposes the novel channel-estimation approach for OFDMA systems. Section 4 presents computer simulation results to demonstrate the effectiveness of the proposed estimation approach. Finally, conclusion is given in Section 5.
where are the pilot subcarriers, for simplicity, it is assumed that , represents the channel frequency response on the th subcarrier. is the AWGN with zero mean and variance of . where , and in the above expression are the block length and the symbol duration, respectively. In (3), , for , are WSS narrowband complex Gaussian processes. is the number of multipath taps. The average power of and depends on the delay profile and dispersion of the wireless channels. The basic block diagram of DFT-based estimation is shown in Figure 1. Block diagram of the conventional DFT-based channel estimation. where . From (10), it can be seen that the channel impulse response will leak to all taps of . The conventional DFT method is no longer applicable as will be nonzero due to the power leakage; the noise and leakage power are mixed up. The elimination of noise will also cause the loss of useful channel impulse response leakage. The basic block diagram of partial frequency response DFT-based estimation is shown in Figure 2. Block diagram of the partial frequency response DFT-based channel estimation. The basic block diagram of our proposed symmetric extension DFT-based estimation is shown in Figure 3. Block diagram of our proposed symmetric extension DFT-based channel estimation. The conventional DFT-based channel estimator is very attractive for its good performance and low complexity. Its main computation complexity is point IFFT and FFT. 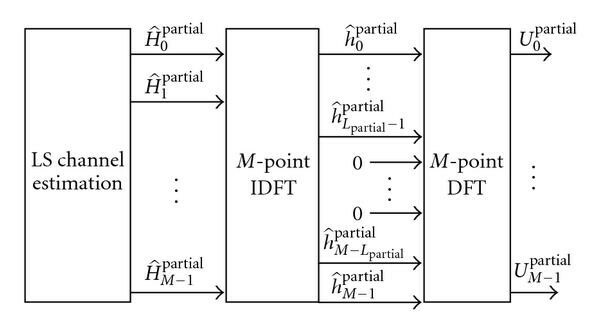 Our proposed symmetric extension method also inherits the low complexity of the DFT estimator, and its main computation complexity is point IFFT and FFT. As the complexity of FFT and IFFT is significantly reduced nowadays, our proposed method can provide a good tradeoff between performance and complexity. We investigate the performance of our proposed estimator through computer simulation. An OFDMA system with subcarriers is considered the guard interval . The sampling rate is 7.68 MHz, and subcarrier frequency space is 15 kHz. A six-path channel model is used. The power profile is given by dB, and the delay profile after sampling is . Each path is an independent zero-mean complex Gaussian random process. Figures 4 and 5 show the comparison of between the conventional DFT method and our proposed method. is normalized to 1, and is set to 16 and 64. It should be noted that the FFT length of the conventional DFT method is , while the FFT length of our proposed method is due to the symmetric extension. That is why the two curves have different lengths. It is shown that is much larger than . Compared with the conventional method, the leakage power is significantly self-cancelled by symmetric extension method. Figure 6 shows the theoretical MSE of the conventional DFT method when . The MSE is calculated under dB, 10 dB, and 20 dB, respectively. The MSE is large when is small, this is because although most noise can be eliminated, the channel power is also lost, and the MSE is mainly caused by the loss of . When is large, although the loss of is small, the noise cannot be eliminated efficiently, and the MSE is mainly caused by the noise. 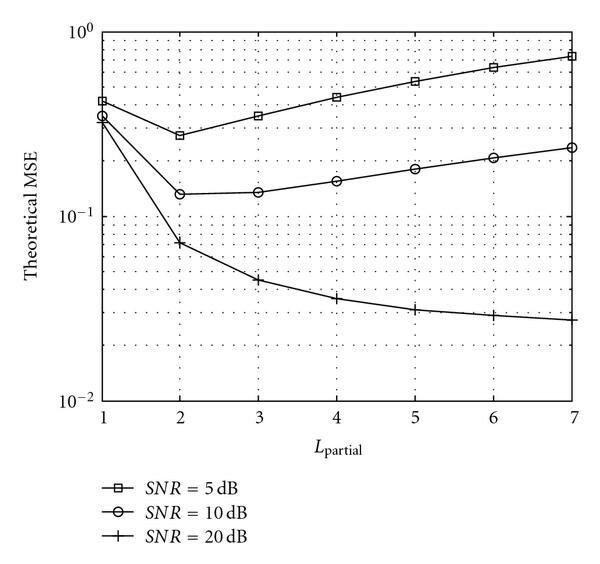 Theoretical MSE of conventional partial frequency response DFT-based channel estimator. Figure 7 shows the upper bound of the MSE of our proposed method. Compared with Figure 6, the upper bound of the MSE of our proposed method is smaller than the MSE of the conventional DFT method. This is because in our proposed method the channel leakage is significantly reduced, and the elimination of noise will cause less channel leakage power loss. Theoretical upper bound of the MSE of our proposed symmetric extension DFT-based channel estimator. Figure 8 shows the MSE performance comparison of different methods. is set to 16. In the conventional DFT method, is set to 4 and 6 as the FFT length of our proposed method is doubled, and the corresponding threshold is set to 8 and 12. When SNR is low, both the conventional DFT method and our proposed method can reduce the MSE. However, when SNR is higher than 15 dB, there is an evident MSE floor larger than in the conventional DFT method. While in our proposed method, the MSE floor is eliminated efficiently. This is because when SNR is low, the MSE is mainly caused by the noise, not the loss of channel leakage power. When SNR is high, the MSE is mainly caused by the leakage power loss instead. As the leakage power is significantly reduced in our proposed symmetric extension method, even when SNR is high, the noise still can be eliminated at very small expense of channel leakage power loss. Figure 8 also shows the effect of threshold. It can be seen that when SNR is low, smaller threshold has better MSE performance than larger threshold, and when SNR is high, it has worse MSE performance. This is because with the decrease of threshold, more noise can be eliminated, but more channel leakage power will be lost, and with the increase of threshold, less channel leakage power will be lost, but less noise is eliminated. Comparing MSE performance with proposed estimator, conventional DFT estimator, and LS estimator, when , , and . Figure 9 shows the MSE performance when is set to 64, is set to 16 and 24, and is 32 and 48. The simulation result is similar to Figure 8. It proves that our method is effective for different values of . Figure 10 shows the raw BER performance with different channel estimation methods. Each subcarrier is modulated by 16 QAM. is set to 16, , and . The channel is equalized by zero-forcing algorithm. It can be seen that the BER with the conventional DFT channel estimator still encounters BER floor because of the channel estimation errors. While in our proposed symmetric extension method, as the accuracy of channel estimator is significantly increased, the BER performance is also improved. Comparing BER performance with proposed estimator, conventional DFT estimator, and LS estimator, when , , and . A simple DFT-based channel estimation method with symmetric extension is proposed in this paper. 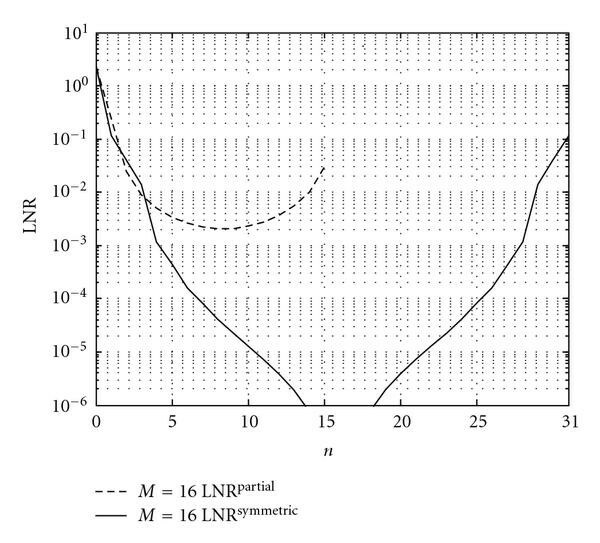 In order to increase the estimation accuracy, the noise is eliminated in time domain. As both the noise and the channel impulse leakage power will be eliminated, we have proposed the novel symmetric extension method to reduce the channel leakage power. The noise can be efficiently eliminated with very small loss of channel leakage power. The simulation results show that, compared with the conventional DFT method, the MSE of our proposed method is significantly reduced.